Okay, let me just cut to the chase and tell you that my most favorite health aid is my neti pot. You might be asking “neti who?” Well, this is just about the greatest little piece of ceramics you may ever own. Basically, a neti pot is a nasal cleansing tool. It has been used for centuries in India and is a safe and natural way of keeping your sinuses cleansed on a daily basis or when you feel a little stuffed up and need some relief. With warm water and a small amount of sea salt, the benefits are amazing! I LOVE, LOVE mine and wish I knew about it way sooner than a year ago. 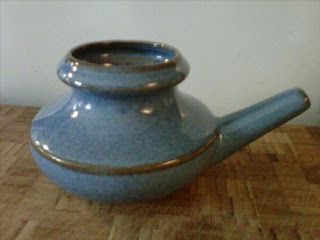 I use my neti pot at least once a week and more when I feel yucky or stuffy or even if I have a headache. When I have felt like an infection might be coming, I added a few drops of grapefruit seed extract (a natural antiseptic and infection fighter) and I haven’t needed any antibiotics yet! If you don’t yet own a neti pot, you truly should! Oh thanks so much for sharing this with me!